What goes around comes around. It is the end of summer. I know because I’m thinking firewood again, burned out on weeding, about done with canning, ready to hunker down and move on. We’ll have more summer, but I can live with night time temps in the low fifties. We have most of the wood we need for the Thanksgiving til Easter stretch. I’ll be scouting for small-dry for the ‘tween months, and have a good bit of scrap left over from the garden shed construction. We’ll get by, one more year. Last night for supper we had our green beans (almost the last of them), our tomatoes (way more green ones out there), our corn (it didn’t make much but it made enough for a few meals), and a small watermelon from a neighbor, plus left-overs of the marinaded chicken I cooked on the charcoal grill a week or so back. Man, that was good! My daughter sent a picture from her cell phone (blackberry) the other day and Dumpa thought it needed way more contrast and saturation. 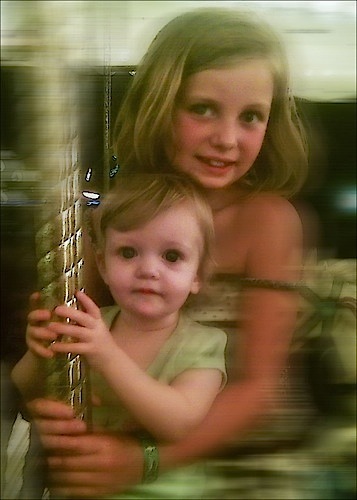 And since the grand daughters were on a merry-go-round (aren’t we all?) I added some motion blur, too. Every time they go around, they’re a year older. Don’t know when we’ll see them again. It’s been a long time since I’ve seen pupils that large!! Beautiful eyes. Such beautiful grandchildren! And you did a great job enhancing the photo. Must you taunt us south Georgia folks with that “50’s at night” stuff? It’s still in the 70’s and 80’s here at night, with November a long way off!